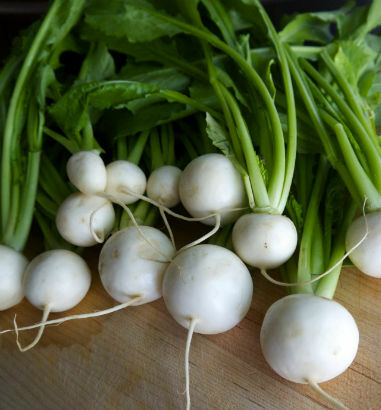 Pretty white haruki turnips are making their debut at the markets this month. They are also known as Japanese turnips. No need to peel them, the skin is very thin, and the greens are edible as well. Haruki turnips cook quickly and are delicious raw in salads, steamed and sautéed. This version of the haruki makes an easy soup for a warm Spring and Summer dinner. Beautiful bright white haruki turnips turn this spicy ginger soup into a perfect starter for your Spring evening dinner. Serve it room temperature or chilled. In a small stock pot heat 1 tablespoon of coconut oil over medium heat. Add the shallot with a good pinch on salt and pepper and sauté until the onion is translucent, about 5 minutes. Add the two gingers and cook for 30 seconds. Add the turnips and potatoes stirring to coat with the the onions for about 30 seconds. Add the water and stock and bring to a boil. If you enjoy your soup with a little kick add a small thai chili to the pot. Cover the pot and lower to a simmer. Cook about 10 minutes, or until the turnips and potatoes are soft. While the soup cooks sauté the ramp bulbs in 1 tablespoon of coconut oil, over medium heat for about 2 minutes. Season with a pinch of salt and pepper. Add the greens with another pinch of salt and pepper and cook until they are wilted, about 5 minutes. Set aside to cool. Once the turnips are soft, turn off the heat and allow it to cool for 5 minutes. Puree using a stick (immersion) or traditional blender, until smooth. Add the lime juice and zest and taste for seasoning. If desired, add a little more coconut oil to the soup. (I added another tablespoon!) Set aside to cool in a separate container. Scrap the greens into a food processor and puree until smooth. Add about 1/4 cup of water to help smooth it out and season with a pinch of salt and pepper. 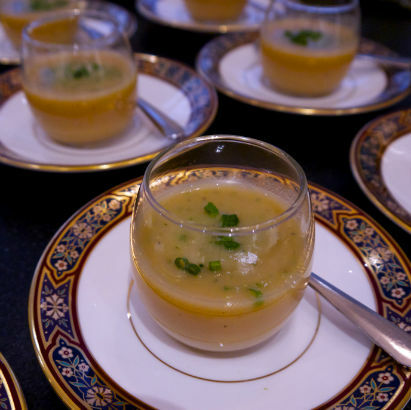 To serve place the room temperature or chilled soup in a bowl and swirl in a dollop of the pesto to taste. Garnish with a sprinkle of finely sliced chives. We're nearing the end of ramp season, but you can still find some at the farmers markets. Use just the pale green and white bulbs for this recipe. Once ramp season ends you can substitute scallion and garlic for the about the same flavor profile. 2. In a small stock pot heat 1 tablespoon of coconut oil over medium heat. Add the shallot with a good pinch on salt and pepper and sauté until the onion is translucent, about 5 minutes. 3. Add the two gingers and cook for 30 seconds. Add the turnips and potatoes stirring to coat with the the onions for about 30 seconds. Add the water and stock and bring to a boil. If you enjoy your soup with a little kick add a small thai chili to the pot. 4. Cover the pot and lower to a simmer. Cook about 10 minutes, or until the turnips and potatoes are soft. 5. While the soup cooks sauté the ramp bulbs in 1 tablespoon of coconut oil, over medium heat for about 2 minutes. Season with a pinch of salt and pepper. Add the greens with another pinch of salt and pepper and cook until they are wilted, about 5 minutes. Set aside to cool. 6. Once the turnips are soft, turn off the heat and allow it to cool for 5 minutes. Puree using a stick (immersion) or traditional blender, until smooth. Add the lime juice and zest and taste for seasoning. If desired, add a little more coconut oil to the soup. (I added another tablespoon!) Set aside to cool in a separate container. 7. Scrap the greens into a food processor and puree until smooth. Add about 1/4 cup of water to help smooth it out and season with a pinch of salt and pepper. 8. To serve place the room temperature or chilled soup in a bowl and swirl in a dollop of the pesto to taste. Garnish with a sprinkle of finely sliced chives.